UNLV’s basketball team kept a few well-chronicled streaks alive Saturday afternoon against San Jose State at the Thomas & Mack Center. First, the good streak. 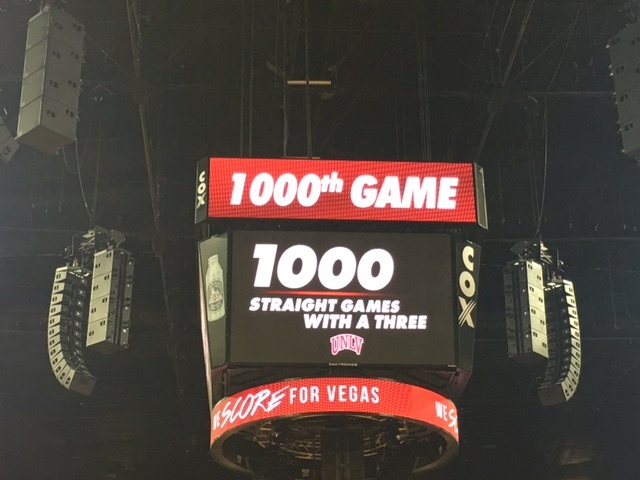 Guard Uche Ofoegbu drained a 3-pointer from the right corner less than three minutes into the contest to extend the Runnin’ Rebels’ coveted steak of consecutive games with a trey to 1,000, tying Kentucky for the longest in NCAA Division I basketball history. But an ugly pattern of missing close shots around the basket and blowing double-digit leads extended their losing streak to six games with a 76-74 setback to San Jose State. Spartans’ freshman point guard Terrell Brown drove past Kris Clyburn and made a short jumper with 13.1 seconds remaining to break a 74-74 tie. The Rebels then shunned a timeout and guard Jovan Mooring’s contested runner from the right side of the lane that could have forced overtime missed at the buzzer. The six-game losing streak is the longest for UNLV since the 1994-95 season when the Rebels also lost six in a row en route to a 12-16 mark under a trio of head coaches: Tim Grgurich, Howie Landa and Cleveland Edwards. “As you can imagine the guys are pretty distraught to have another close one slip away,” UNLV coach Marvin Menzies said. “That’s six losses in a row now and four of them by a total of (ten) points. It’s tough man. Tough. Tough Tough. You have to go back to 1958-59, UNLV’s first season of basketball, to find a longer losing streak. The Rebels opened that campaign with nine straight losses which remains a school record. UNLV (10-16, 3-10) used a 14-0 run that featured nine consecutive points by forward Tyrell Green to build a 26-16 lead midway through the first half and led 36-31 at halftime. But San Jose State (13-10, 6-6) methodically chipped away and then built a 66-58 lead on a 3-pointer by Cody Schwartz with 7:18 to go. Mooring scored 10 points during a 11-6 UNLV run and the Rebels eventually tied it at 74 on another Ofoegbu 3-pointer with 39.5 seconds remaining, setting the stage for Brown’s game-winner. It was the fourth straight win for the Spartans who swept the regular season series while defeating the Rebels for just second time in 20 games in Las Vegas. WHO STOOD OUT: Pretty balanced effort for the Spartans who had four players in double figures but Brown (12 points) and sophomore guard Jaycee Hillsman (team-high 16 points on 6-of-8 shooting) came up with the big baskets in crunch time, mainly on drives to the basket. Forward Brandon Clarke had a quiet 13 points but also had seven rebounds and was a defensive force around the basket with five blocks. Green came off the bench to lead the Runnin’ Rebels in scoring for the third time in four games, finishing with a career-high 28 points and also grabbing nine rebounds. Senior forward Christian Jones had his fourth double-double of the season (11 points, game-high 12 rebounds) while Mooring added 18 points and eight assists but also had five turnovers and a key foul diving for a loose ball on the other side of half court with just a second left on the shot clock that San Jose State guard Jalen James parlayed into a pair of key free throws and a 74-69 Spartan lead. Ofoegbu finished with just six points but connected on the milestone 3-pointer to extend UNLV’s record streak. UP NEXT: The Rebels have a week off to regroup before playing at San Diego State on Sunday, Feb. 19, at 1 p.m. The contest will be televised on CBS Sports Network. NOTABLE: The regular season series sweep was just the second for San Jose State. The Spartans also accomplished the feat in the 1993-94 season. … UNLV fell to just 8-8 at home this season. … The Runnin’ Rebels won the battle of the boards, 38-29, and had 17 offensive rebounds which they turned into a 22-10 edge in second chance points. … UNLV finished 21-of-31 at the free throw line while San Jose State was 13-of-16. … The Runnin’ Rebels shot better than 40 percent (23-of-56, 41.1) for the second straight game after failing to accomplish that feat in 12 straight games. … San Jose State, which shot 52.8 percent and was 7-of-13 from 3-point range, finished with a 34-28 edge in points in the paint. 1,000 consecutive games with a made 3-pointer! !